If you have not read part one, see it here. Goatie could open doors and gates, and would often get into our sheds, or let the other goats out, so every door had to have double latches. She LOVED riding in the car. When people would come over, she would try to jump in their vehicles when they opened the door. Often times I would just take her for a ride to town. She would jump in and lay down on my lap and just sleep the entire way. Once she got big she could not fit on my lap anymore, so she would put her front feet on me and her head and just get as close as she could. She loved me so much. Every time she had babies she would wait until I got there, I witnessed every single one of her 11 births. She would cry for me when I went inside. Or if I sat outside she would lay down beside me, and rest her head on my lap. After a couple years Goatie grew too fat. We tried to put her on a diet, but since she ran free she pretty much just ate what she wanted. If we locked her up she would cry and cry. Fat can cause problems when goats kid (have babies) and one time she had a stillborn. She mourned that baby like no animal I have ever witnessed. It was winter so we could not bury it. So we wrapped it in a towel and hid it on the other side of the house. Overnight she actually found it and was standing over it the next morning protecting her baby. After we buried it it literately screamed and cried for two weeks. She wandered around looking everywhere and under everything for her baby. Because I raised her and made goat sounds to her when she was young, her voice did not sound like the other goats, it sounded like my voice when I try to make a goat sound. It is weird. But her cries were eerily human sounding. It was so sad, that no one wanted to go outside during this time because her mourning was just so depressing. Eventually she got over it, but we decided not to breed her again because of her weight. She loved babies and was determined and she managed to get in with the boys. So we waited and prayed that everything would go smoothly. The time came and she had 4 kids. Everything went great, and I was so relieved. She was happy again. Then two days later, she went back into labor. We have no idea why, there were no more babies in there. The vets could not / would not do anything. They thought her uterus had ruptured and that she was bleeding internally. So I sat watching my beloved Goatie get weaker and weaker everyday. Goatie was so strong, I thought nothing would ever bring her down. She was still eating, drinking, and walking up until the last day. That is rare. One night she was doing about the same. I sat down with her and snuggled her, and stroked her head. I wanted to stay with her, but the vet told me that I was probably stressing her out by being with her all the time and that I needed to just let her rest. So I talked for a while, then I kissed her head and went to bed. In the middle of the night my dad went to go check on her. He found her passed away in the yard, half way to the house. She was trying to get closer to us. 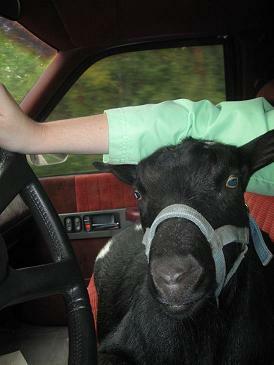 That is my biggest regret in life, was leaving that goat. I should have stayed with her when she was scared and hurting. I should have known better. I miss her more than anything. She died a year ago, and even now I am sitting here bawling like a baby. Words can not describe how much I loved that crazy animal. The only thing I have to cherish is that she gave me one last gift, her 4 babies. 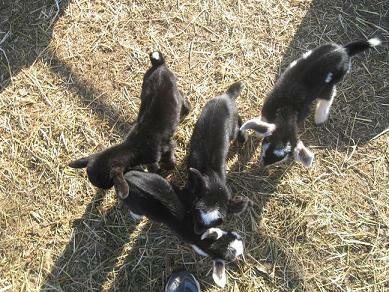 I kept two of her babies, and gave the other two to my goat mentor who helped me save her all that time ago. One looks just like her, and they both act just like her. They follow me around, and enjoy riding in the car. I find it so amazing that even though they were not raised by their mother, there is such a resemblance. I look at Tippy (the one who looks just like her) and it makes me smile because I think of her. I had to bottle raise them too, so they have her same voice. They have her eyes. I love them so much. I also have 2 other babies of hers from previous years. And that is the long story of Goatie. Eventually I will post about my other goats, but I think I have said enough for today. this is so sad. I'm crying. Reminds me of my own pets who have died. Thanks for sharing. It made me cry too. How cool that you have her babies. Pets are the best! And this was the best goat story I have ever heard or read. Thanks for sharing. I actually had one of her babies sold. Of course it was my favorite one. After she died I could not bare to part with it, so I called the buyer and ended up trading them for one of my other higher priced goats. I lost a couple hundred dollars, but it was well worth it. Wow, what a story! It made me sad too remembering pets I've lost over the years. What good memories you have though! thank you for sharing about Goatie - what a wonderful animal. 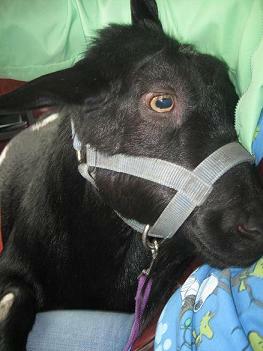 Goatie was a very special girl.